Hi, I am interested in your 1948 Chevrolet 3100 (stock #4704-ATL) listed on Autotrader for $46,995. I'd like to get more information about this vehicle and confirm its availability. Part vintage, part custom and all awesome. 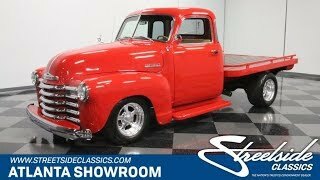 This 1948 Chevrolet 3100 5 Window Flatbed rolled off the assembly line to serve dutifully as a produce truck and decades later got the full benefit of a frame off restoration that was performed to seriously high standards. Its only logged a little over 5000 miles since its transformation and is in top form in all respects. You dont often see flatbeds in such a stellar state and this 48 is a TRUE flat bed - that pragmatic, open back half was already in place from the start. It wears Victory Red over its exterior - an appropriately named shade as this vintage ride is no doubt a winner - and the paint is in great shape. Get up nice and close and youll be impressed at its smooth, unblemished texture, and its strong clearcoat provides a strong shine. Chevy trucks of this era featured outstanding front grilles - five substantial, horizontal bars of chrome positioned underneath an emblem - and the example here does that styling cue proud with its ultra clean condition. Fresh looking exterior fittings, including the front bumper, side mirrors, hood badging and windshield trim, inject even more vitality into this timeless classic. Its got a great stance, sitting low over its front wheels while still allowing for reasonable ground clearance, and has just a slight upward incline to the rear, where youll see that the taillights have been skillfully recessed into a custom roll pan. The tan interior furnishings are the perfect complement to whats on display outside and Its evident that plenty of attention went into creating a very clean and well-thought out driving environment. The leather bench seat is a standout - its got a race inspired, nicely detailed design that blends perfectly with the door panels to each side and the headliner above and looks to be in near-new condition. A chrome Lokar shifter rises to within easy reach of the driver and wears a matching leather boot, and the Chevy-branded billet steering wheel also ties into the color scheme with its leather wrapping and sits in front of a stellar dash area that features an assortment of white-faced TPI-Tech gauges, as well as quartet of in-dash vents to bring cool air into the cabin via a climate control system thats functioning at its best. The bed area in back has been finished VERY nicely, with its ramrod-straight wooden planks prepped to a mirror-like finish and held in place by unblemished stainless steel. A Kenwood AM/FM/CD head unit also joins the mix and provides a very clean audio experience. The array of top-tier components on hand leaves no doubt that this truck was intended not just to draw attention, but for inspired driving as well. A 350 cubic inch ZZ4 V8 sits under the hood, armed with aluminum centerbolt heads, an aluminum bowtie intake and a Holley Demon 4-barrel carb while teaming with a 3-speed automatic TH400 to propel this vintage Chevy with plenty of power. The powerplant looks every bit as great as it runs - its chrome dress-up kit really pops against the deep red inner fenders and firewall that surround it. The added Mustang II front end provides a number of benefits to elevate the driving experience, including power rack and pinion steering and power disc brakes that are joined by the pair in back. A sizable radiator sits up front, paired with an electric fan to keep running temperatures in check while an HEI ignition provides maximum spark as this eye-catcher rolls on a set of 15 Billet Specialties wheels wrapped with BF Goodrich T/A radials. Equally adept at turning heads at car shows or on the street, this 1948 Chevrolet 3100 5 Window Flatbed is a rare and distinctive find. Call today!